I really love simplicity. It seems like our lives are full of so much stuff we don't need and that became really evident in my replacement MDA phone. It had tons of cool features (some of which I liked) but it had way to much stuff that I didn't need so I took it back and got another blackberry. I was reading in Business Week this month about a cool new Blackberry "Pearl" coming with a camera which I'd really like on my phone but all the other jazz just slows it down I think. Nathan Holritz showed me this cool new service for reading magazines called Zinio Reader where you can just order magazines and get them on your computer and then you can search them for keywords and stuff which is way cool. I don't suggest peope read a lot of magazines "Fast Food Knowledge" but there are a few good ones out there. Ok!!! PARTNERCON IS HERE!!!! WOOOHOOO! See ya'll tonight!!! 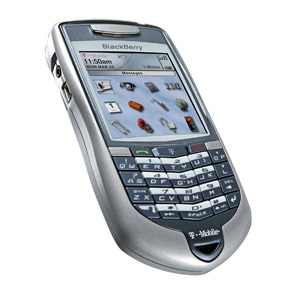 Blackberrys do rock - precisely because they are simple. Usability and design over features any day! i love that "back to simplicity" means going to a blackberry. Anyone see the cool ads for Verizon's Chocolate by LG? The pearl will be like that (mp3, camera, etc) only better! I'll be upgrading from my 7105 in about a month!